Thank you to all who participated in the October Bone-afide Challenge! Here are a few of our FAVORITE entries including the winner at the bottom! We love the detail in the Spooky title & love the photos of the decorated porch and yard! 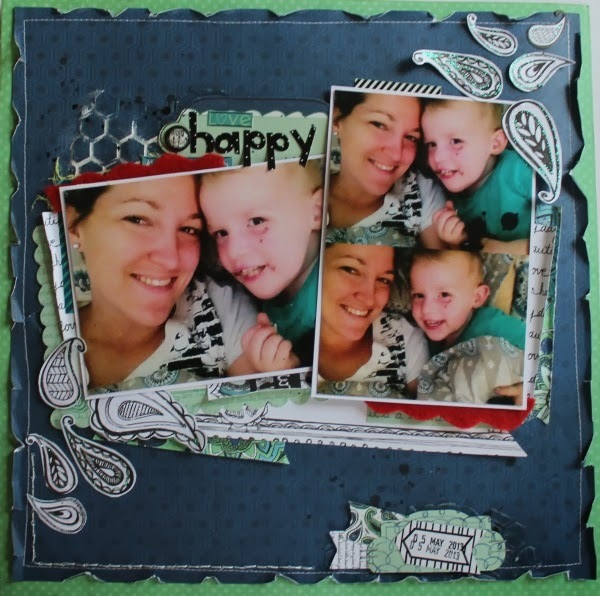 This layout was submitted from a customer who purchased her kit at I'd Rather Bee Scrapbooking in Sandusky, MI. We love the great use of the cutout as a boarder for their photo. 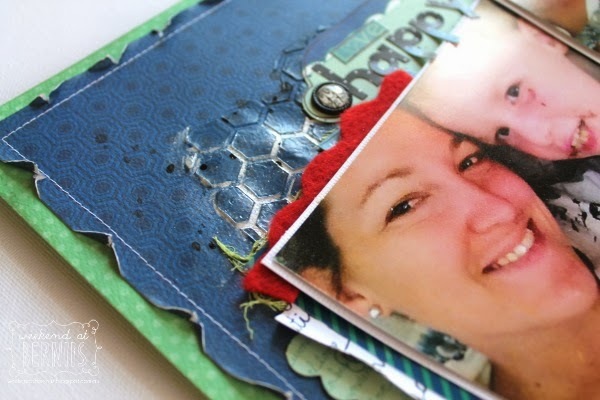 We also love how they combined the papers, especially the fussy cutting of the banners from one page to the next! 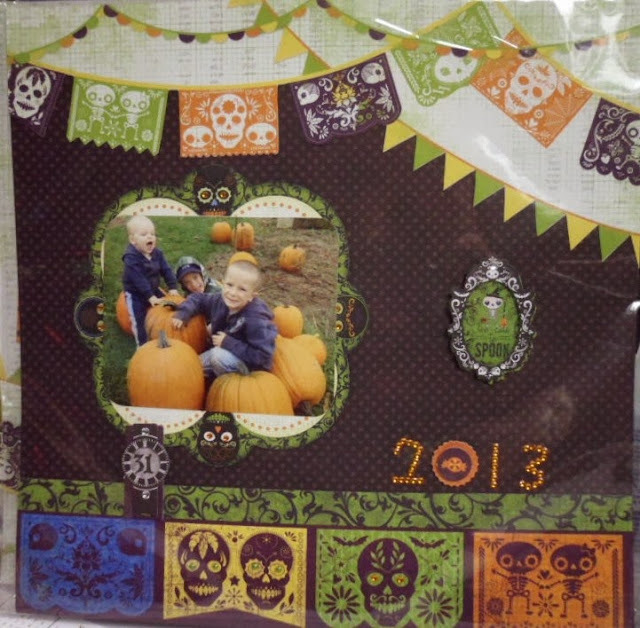 This layout was submitted from a customer who purchased her kit at Croppin' Bug in Texas City, Texas. We love the unique size, placement and shading of the photo mats! This page is adorable and flows so nicely! This layout was submitted by a customer who purchased her kit at Darla's Flowers, Gifts, and Scrapbooking from St. Joseph, MO. We love how the bottom left tag opens like a door! Congratulations to the customer who purchased their kit from Craft Crossing in Gonzales, TX! 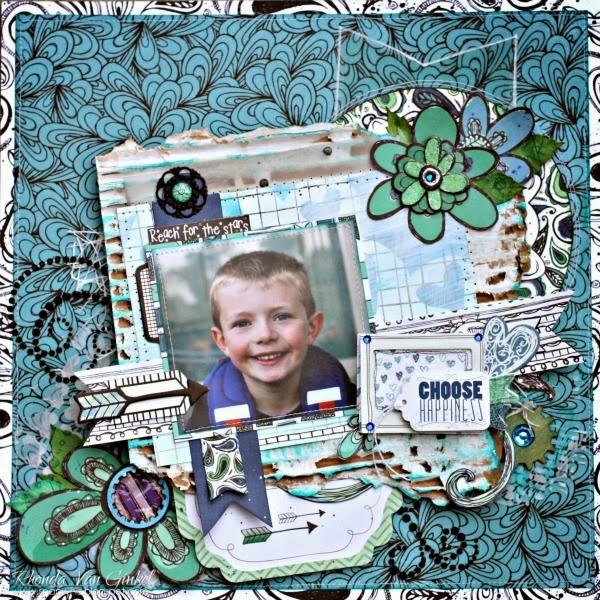 This layout has been selected as the WINNER of the October Bone-afide Challenge!! Your customer has won a $150 BoBunny prize!! This customer has only been crafting since May of this year! We love how interactive this layout is, the doors opening and trick or treaters at the door! The attention to detail is fabulous! Great work!! Don't forget our next challenge the November Blog Class Challenge starts on November 4th (that's MONDAY)! Ask your local store how to purchase a kit, or contact us at bopress@bobunny.com for purchasing information! Now, for some mixed media layouts! While I was creating this layout I wanted to go for a more feminine look with the Zip-A-Dee-Doodle collection. So I used tutu double dot paper as a touch. I used some stencils with deco past and lots of pink and green glimmer mist to make it mixed media style. The picture is me on my wedding day in 2012. When we received this assignment for the Zip-A-Dee-Doodle Mixed Media assignment , I was happy because I had just purchased my first jar of molding paste! I knew I wanted to use some masks and put the paste to work and build texture. It's also fun to up-cycle and add in a few things that you have already, like cardboard or fibers. I painted mine with some gesso, then added some dry brushed acrylic paint for accent. Then I touched the edges of my photo with the paint very gently. The next photo shows my mistake. I used a heart mask on an area with some inka gold metallic rub and it turned out way too dark, so I disguised it with a light coat of gesso. It was a perfect subtle effect. The upside -- the rub worked perfectly on my Kraft Wooden Gear! I love that there are truly no mistakes in mixed media. Add what you like, fix what you don't. Use staples, glue, paint, fibers, gel, you name it! I experimented with some new products and now have a lot more confidence in using those items for my next projects. 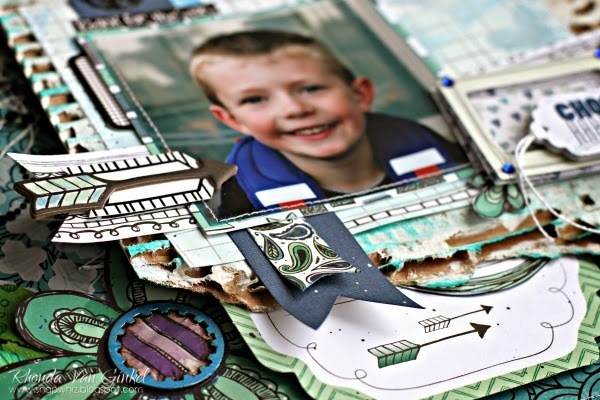 The Zip-A-Dee Doodle collection is really a perfect match for mixed media, it's really fun! 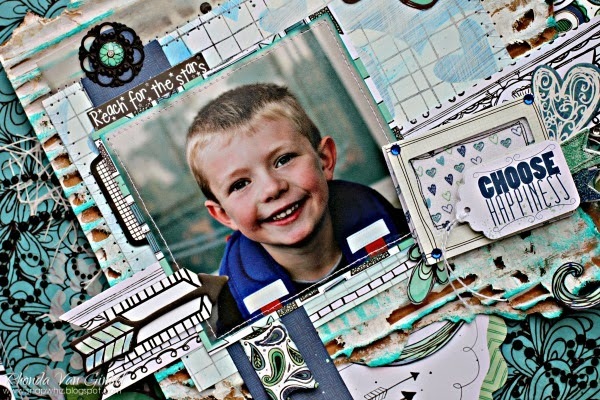 Well when we received the task to create a mixed media project using the Zip-A-Dee-Doodle collection, I decided to create a simpler layout to show that you do not need a ton of different products to create part of a mixed media look. If you are just starting out and wanting to play around with something subtle , Impasto texture gel is fabulous. It is a gel that you can either add your own paint or inks too to create any colour that you want. Or if you would like a subtle look like mine you an just add the impasto directly to your background and let it dry clear. I did this not to detract from the Zip-A-Dee-Doodle papers. Then if you are daring and would like to experiment more, play with inks , fabrics anything that takes your fancy! As long as you are having fun in the process. Double Dot Paper: Jade, Denim Stripe. Congrats to the winner!!!! Loving all the lo's today! They are gorgeous!!!! Big congrats to the winner! Your page looks amazing! And I also adore each one of today's lay-outs. Fab work! Congrats to the winner! Super projects from the DT too...loving them all! The layouts created with the kits are amazing, some amazing ideas from such a cool kit! I LOVE how the winner has created such an interactive page, fantastic!